Mighty Thor was known as one of the greatest warrior-gods of the Norse pantheon, possessing strength beyond many other god-heroes of myth and legend. 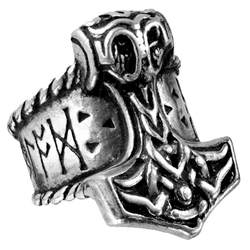 With the Thors Runehammer Ring, you can grasp a portion of his power. Symbolically, this ring is a potent seal that is perfect for warriors who might seek Thors blessing, either in fantasy and fun or in the modern world, where even a god of Thunder might still have worshippers. The ring features, on its front, the legendary hammer of Thor, Mjolnir, rendered in impressive and attractive Celtic knot patterns. The band features two runes that are near and dear to Thors heart, those being blood and thunder, indicating two things that this warrior-god of storms would have encountered quite a bit. The ring is crafted from fine English pewter that features a rather handsome luster. The ring is available in several sizes. Modern-day Vikings and Norse adherents who still pay their respects to the old gods will find that Thors Runehammer Ring is a great way to pay homage to this old god throughout your day-to-day activities, and even those who just have a love of myth and gothic design will find that this ring stands above the rest.